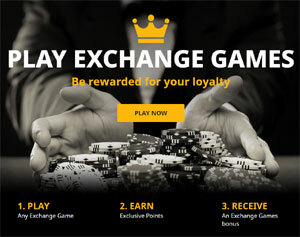 betfair Exchange games are another unique product from betfair, giving you the chance to bet on casino games using betfair's innovative betting exchange, so you're betting against other punters, rather than just the casino. Fast, exciting and completely unlike anything you'll find at other online casinos, betfair Exchange games are a great new way to gamble online. betfair Exchange Games are computer generated games where you get to watch the action and back your judgement as events unfold. A variety of exciting, simple and addictive games are available (see below for complete list). As if that wasn't enough, turbo editions speed up the action even further, so you really have to have your wits about you as you revise your strategy and react to what is happening. betfair Exchange Games are a genuinely exciting gambling experience, which betfair proudly claim is 'the future of casino'. betfair Exchange Blackjack gives you the experience of sitting behind a Blackjack table in a casino, watching four players take on the dealer, and betting on which player you think will win! Each game takes place over a maximum of 7 rounds and you can change your bet after each round. You can bet on any number of players, the dealer, or four 'exotic' bets - for example, you can bet that at least one player has five or more cards. betfair Exchange Texas Hold'em is an innovative new way to play online Poker. Imagine sitting behind a Vegas poker table, being able to see all four hands on the table and bet on any of them - to win or lose! And you can do this at all stages of the game - pre-deal, after the deal, after the flop and after the turn. You're not actually playing a hand, so no-one can bluff or bully you - you just use your Poker knowledge to recognise the best hands and place your bets at the best odds. Exchange Hi Lo is a fun and entertaining version of the old fairground game HI-LO. The computer uses 1 suit (13 cards) and turns them over one at a time. Prior to turning, the computer predicts whether the following card will be higher or lower than the previous one. You win by predicting how many cards the computer will get right. You can bet before the game begins and after each correctly predicted card, as often as you like for as long as each game continues. Simple, fun and totally addictive! In traditional Baccarat, you have to place your bets before the game starts. betfair Exchange Baccarat allows you to watch a game of Baccarat and bet as things change! Each game takes place over a maximum of 6 rounds and you can change your bet after each round. In addition to the standard Banker, Player and Tie bets, there are also a number of side bets, to add to the interest and excitement. Bullseye Roulette is a fascinating twist on Roulette. Whereas normal Roulette depends on the result of 1 ball falling into one of 37 holes, Bullseye Roulette works in a 4 round game with a total of 18 balls being dropped! The 18 balls are dropped into a traditional roulette wheel, numbers are eliminated and the last number remaining is declared the winner. Confusing? It can seem so at first, but once you start playing, it's extremely addictive, especially in the Turbo version where the action is 25% faster than the standard version! Much like the Kentucky Derby games at the fairground (where you roll balls to move your horse forward) Card Derby Racing is a racing game where the turn of the cards decides who wins! Before the race each suit is handicapped by having 3 cards removed. You can see which cards have been removed, allowing you to bet before the race (BACK or LAY) and then after each round. After each round, new prices are issued, giving you the chance to either bet again or hold your position. Omaha Hi is an increasingly popular variant of Poker. betfair Exchange Omaha Hi works in a very similar way to Exchange Texas Hold'em (above). You have the same opportunity to watch and bet on a game of Omaha Hi, changing your bets as the game unfolds, but in addition to just betting on the winner, you can also take advantage of the side bet market, which allows you to place bets on the ranking of the winning hand! It's an engrossing and exciting new way to bet on online Poker.